Genre is the one of the most difficult foundations of Story to wrap your mind around. There are so many theories and categorizations of genre that the editor/story student can easily fall into an intellectual whirlpool. I’ve been sucked in so many times by so many different ways to look at genres that my head spins thinking about it. I’m so susceptible to genre inside baseball that I even named my literary agency, Genre Management Inc., to remind myself of its importance. Not surprisingly, where I finally come out on genre serves the purposes of my method of editing a story. My goal is and always has been to take comprehensive theory and make it practical. So I started my deep dive into genre with a few core goals. How can the conventions of a particular genre be codified and written down as a list of must-have obligatory scenes or conventional characteristics? How can we use those conventions and obligatory scenes inherent in genres to best effect? How can we make practical use (taking an idea and extrapolating a “doable” and “testable” task?) of the deep thinking about genre in order to best evaluate our work? So my exploration of genre is purely practical. What follows is a combination plate of theories from many different sources from Aristotle and Plato, to Goethe, to Georges Polti, to Norman Friedman, to Will Wright and others. But the biggest influence on my thinking is Robert McKee, bestselling author of Story: Style, Structure, Substance and the Principles of Screenwriting, and his colleague Bassim El-Wakil. Full disclosure, McKee and El-Wakil are clients of my literary agency so I’m certainly partial to their work. However, I do not receive any commissions on McKee’s category killer book Story. But when McKee and El-Wakil release their own book on Genre, I WILL, without hesitation, recommend that you read and digest everything they have to say about it. But until we get their masterwork, here’s a crash course from my experience to get you started. A Genre is a label that tells the reader/audience what to expect. Genres simply manage audience expectations. It’s really that simple. Don’t let the French etymology and pronunciation scare you. We all know what to expect from a mystery novel, a love story, or an action movie. These categories tell us what we’re in for when we pick up a book or go to the movies or the theater. But what are those buried specific expectations that must be satisfied before a story lands with us? What do we expect to know about a story before we’ll even consider listening or reading or watching it? As per McKee and El-Wakil, there are five primary expectations of the audience. We expect to know how long the story will last. We expect to know how far we’ll need to suspend our disbelief. We expect to know the style, the particular experience of the story. We expect to know how the story will be structured. We expect to know what the general content of the story will be. With these five questions in mind, McKee and El-Wakil sorted the myriad of familiar genres we all know intuitively into five major categories. I find it helpful to think visually and with most of the blood flowing through my veins being of Irish origin (the book publishing company I co-founded with Steven Pressfield is called Black Irish Books) I think of the five categories as leaves on a Five Leaf Clover. Each of the five leaves informs the central locus of the clover, the Global Story. In order to manage the most primal of reader/audience expectations, writers must make at least five clear choices, at least one from each leaf. And more often than not, with secondary and tertiary subplots, they’ll use more than one from a particular offshoot. But more on those choices later. Here is how I define McKee and El-Wakil’s five big categories, our leaves on the five-leaf clover that answer each of the questions above. TIME GENRES answer how long the story will be. REALITY GENRES answer how far the audience will have to suspend their disbelief. STYLE GENRES answer how we’ll experience the story. STRUCTURE GENRES answer how broad or minimalist or nontraditional the global telling of the story will be. The last leaf, the CONTENT genres, are the ones everyone thinks of when they think of genre. I further divide CONTENT into two sub categories, which I call the EXTERNAL and the INTERNAL. More on why I do this later on. CONTENT GENRES answer the theme/controlling idea of the story. EXTERNAL CONTENT GENRES (The black, grey, and red boxes on the infographic) determine the conscious object of desire for the protagonist/s. More on objects of desire later on. 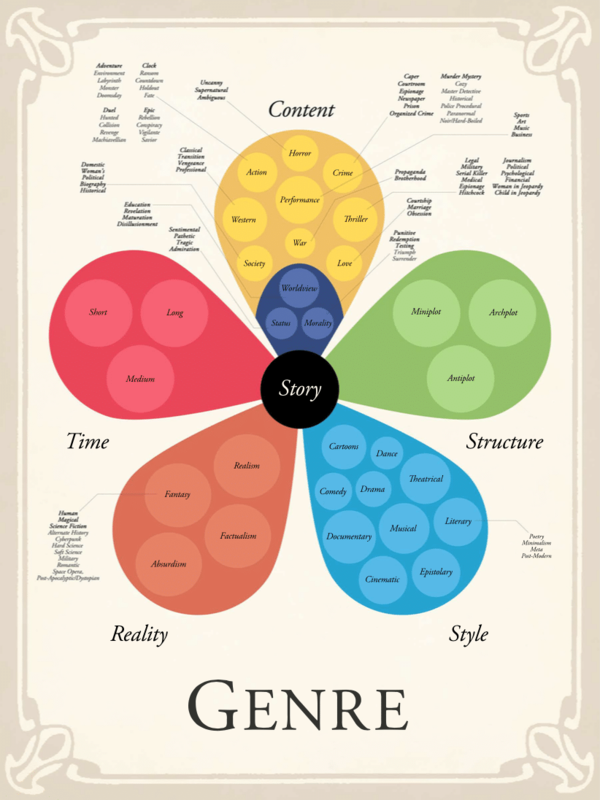 INTERNAL CONTENT GENRES (The blue boxes on the infographic) determine the unconscious object of desire for the protagonist/s. And here are specific choices a writer has at his disposal for each of the big categories. This list is by no means exhaustive, but it’s comprehensive for our purposes. (Look at the Genre Infographic in the Resources section for reference). Short Form—these are short films, short stories, or individual scenes in a play. Medium Form—these are episodic television shows or documentaries, novellas, multi thousand-word journalism, one act plays. Long Form—these are feature length films/documentaries, novels, or three acts or more plays. Factualism—stories that refer to facts of history or biography. They refer to part of the historical record implying “This Story Did Happen,” like the movie Argo or 12 Years a Slave or Serpico. Realism—stories that could happen in real life, but are imagined, Law and Order, the crime novels of Ian Rankin etc. Fantasy—stories of wonder and imagination that require a comprehensive suspension of disbelief, the type of which is delineated by three subgenres. 1. Human—anthropomorphized reality like George Orwell’s novel Animal Farm or fantastical experience like the movie Groundhog Day that can be set in one of two time periods. 2. Magical—stories about fantastical worlds with magical laws that can be mastered by certain beings, but not everyone, like The Lord of the Rings. STYLE GENRES—the various ways in which we experience a story. Drama—a tone of solemnity, facing reality as it is. Emotions are truthful and fulfilling. Comedy—funny, making jokes at the worst possible time in order to avoid truthful emotion. Documentary—fact based tone like the film The Battle of Algiers or “mockumentary” styles like This is Spinal Tap. Dance—Martial arts films like Crouching Tiger, Hidden Dragon. 2. Minimalism—short fiction from writers like Raymond Carver, Will You Please Be Quiet, Please? 3. Meta—self-referential works that present stories about stories, like The Crying of Lot 49 by Thomas Pynchon or Infinite Jest by David Foster Wallace. 4. Post Modern—fragmented and subversive of formal Story Structure, Naked Lunch By William Burroughs. STRUCTURE GENRES—more on these later. CONTENT GENRES—more on these later. EXTERNAL CONTENT GENRES—stories driven by a global external value and its positive and negative charge as outlined for each below. Status—Success/Failure moving from one ladder of society to another. You probably have a general idea of the kind of Story you’ve already written or the one you want to write. You know it in generic terms. Now is the time to reconsider and clearly define your choices. Doing so will ground your work so that when you get stuck, you can always go back to these choices and evaluate whether or not you’ve abided their conventions and/or obligatory scenes. On the first leaf of our Five Leaf Genre clover are the TIME GENRES, which are usually self-evident. You want to write a novel or a short story or a screenplay for a short film. Any one of them is valid. Any one is easy to label. The same Story and Story Grid principles abide for all of the time genres. Chances are you’ve picked from the REALITY and STYLE leaves too without thinking too much about them. And that’s fine. Micromanaging the choices you make in Time, Reality and Style can result in paralysis by analysis. Remember, The Story Grid and everything it entails is a tool. It is not an end in itself. So to obsess about whether your Story is a drama with comedic elements or a comedy with dramatic elements is time best spent elsewhere. Terms of Endearment, the novel and the film, use both Comedy and Drama in the telling. You can too with your Story. But when push comes to shove, I think we’d all agree that Terms of Endearment is globally a drama. It concerns itself with real emotional truth. Whereas, the global Comedy, There’s Something about Mary relentlessly avoids emotional truth. It’s important though to clearly write down exactly what choices you’ve made. Doing so will allow you to go back later on and make sure that you consistently abide the conventions of those choices. For the nature of REALITY leaf, if you’re lead character is anthropomorphized, you’re definitely working in the Fantasy arena. If it’s a novel based on a historical event, you’re in the FACTUALISM arena. I’ll say it again. What’s important is to write all of the choices down. I’ll suggest a one page Story Grid “Foolscap Method,” a phrase I’ve borrowed from Steven Pressfield and his mentor Norm Stahl, later on that you’ll use as a lifeline to track your global story. It will be the 30,000 foot view that will put you back up in the sky and settle your nerves when you inevitably panic and think you’ve crashed your story. You’ll use the Foolscap Global Story Grid along with The Story Grid Spreadsheet (which tracks the micro movements in your story) to create your final Story Grid infographic. Now with the first three leaves of our Five Leaf Genre Clover considered (TIME, REALITY and STYLE), we’re ready to detail the complimentary relationship between the fourth leaf—STRUCTURE—and the fifth leaf—CONTENT. When I can learn this much in a 5-minute read on a topic I thought I knew, I’m in the right place. This is gonna be fun, Shawn. Thank you. I concur. There’s nothing worse tan having an idea and no direction. This is so helpful. So I guess this will need a re-read or two to really sink in… Which is awesome! Really great meaty content. Thanks for sharing this, Shawn. Was wondering, though: how would you classify something like Magical Realism, say One Hundered Years of Solitude, for example, within your framework? These are the broad classifications. As I think I mentioned in the piece, the writer needs to have at least “one” of the genres from each of the five leafs. You can certainly meld and add more in sub plots and/or global effects. So magical realism would be a double serving from the Reality leaf. Have to admit I haven’t read One Hundred Years of Solitude in like twenty years, so for the other leaf categories I’m not positive. But given time, I could probably mash it into my Story Grid universe. But I don’t doubt there are plenty of Stories that aren’t all that informed by my global system. I ain’t the Grand Poo-Bah of it all. That’s for sure. That’s the part I was missing or didn’t get, I think. I asked because I’m still ruminating on the idea of internal content genres, and it seemed like Magical Realism might have Realism as an external genre and maybe a hint of absurdism or magical fantasy as an internal genre. But perhaps the “magical” part of Magical Realism lies in global effects. The other reason I was curious is that there are more than a few fantasy writers who take offense at the term “magical realism” in the same way that sci-fi writers bristle at the term “speculative fiction” — to them it’s a literary society dodge from giving their genre proper respect. As in, Because Garbiel Garcia Marquez is a “serious writer” he can’t possibly be writing fantasy; it’s magical realism. Of course, all that gets away from using your tools as, well, tools for writing, rather than tools for BS-ing about literature. Anyway, thanks for responsing. Looking to hearing more about sub plots, global effects, internal genre, and the Story Grid in general. Naming a genre is as much art as science. Marquez writes stories which, except for trickles of blood crawling the streets and the like, would be the world we really live in. Fantasy feels like it should mean that it’s clearly not the world we live in, despite any similarities. Of course, in the end it comes down to satisfying the expectations of your desired fandom. If you and they agree on whether it is, in fact, magical realism or fantasy, everybody goes home happy. To my way of thinking, “The Swimmer” by Cheever is magical realism and I have a difficult time labeling it fantasy. This series is blowing my mind – can’t wait for more! Shawn, this is like a free MFA program, with the bonus being that the “faculty” has no interest in feeding us BS! Thanks so very, very much! I really look forward to these posts. Actually, one more thing: remember when your older cousin used to sit you down and explain to you a reality of how life works? Something that totally makes you see an object in a different way? This is the equivalent of that. This may have been asked before, but Shawn, in The Story Grid book, are you planning to outline obligatory scenes/characteristics for the main genres? Is there any literature in the meantime we can read that deals with this for a broad set of genres (not just hero narrative)? As the central example in the book is The Silence of the Lambs, I will do it for Thriller and the Disillusionment Plot, which requires that I also do it (to a lesser degree but I think comprehensively if not microscopically) for Horror, Crime and Action in The Story Grid. I do plan on moving into other genres down the road and outlining those features and will do additional books on them too. My gut is to run some kind of contest after I finish The Silence of the Lambs and do a deep dive into the next title (and its corresponding genre/s) which would be chosen by the people who sign up for the Editorial Board. I don’t know of any other book that goes into the specific genres in the way that I do. It’s kinda why I’m writing all of this stuff down. One small point. In my thinking, the Hero Narrative is a structural genre (Archplot) and not a content genre and I will get into it in more detail within the next couple of posts. What a brilliant way to communicate hard-won understanding. I particularly like the demystifying idea of genre as a way to manage expectations. So when are you going to make a poster of that five-leaf clover? The poster will be ready when we publish the book, sometime in January or February of 2015. I’m working with our creative director now on all of the art. And I think it’s going to be very cool! Great series, Shawn. Keeping my attention and interest. Ditto the comments of others here with regard to the accessibility and practicality of your process. Appreciate it and everyone else who has let me know this is of value. Keeps me pressing on…and so I will. Question: should non-fiction works like business and management advice, “how-to,” etc. be written with the foundation of Genre in mind? Do they have (should they have) Story Grids? Maybe the answer is “yes,” right? Maybe they would be better, more compelling works if they were, and did. I apologize if I’m a little off-topic. I look forward to Shawn’s answer re: genre in nonfiction as well, but I’ll toss this out: nonfiction which includes the 12 waypoints of a good novel would certainly be better in many ways than that which attempts to emulate the encyclopedia or the classroom. Yes, Joel! I’d bet on this: true or not true, it probably all comes down to great storytelling. Yes Nonfiction has a slew of genres too. The stuff that works best follows STORY principles just as a great novel does. Case in point is Walter Isaacson’s biography of Steve Jobs. It combined the external PERFORMANCE/BUSINESS genre with a MATURATION PLOT for Jobs’ INTERNAL arc. The book was terrific. Now Isaacson’s latest, THE INNOVATORS, isn’t nearly as compelling. Why? Because it’s a hodgepodge of mini-bios that never really comes together as a whole. This is my opinion of course. The STORYTELLING just isn’t at the level of JOBS. I stopped reading after 50 pages and I have to say that the point of view of Isaacson is very off putting in THE INNOVATORS. He begins the book by telling the ready how connected he is and then runs through all of his successes as a journalist and a writer and of how this subject out of all those innumerable ones he could easily enlighten us about, he found worthy of his time. You know because he was so close to Steve Jobs. Ugh. I agent quite a bit of nonfiction and the first question I ask of a potential client is WHAT IS THE STORY? I want to know what the writer thinks the arc of the story is (it’s genres) no matter what subject matter…business creation narratives, biographies, prescriptive nonfiction etc. I want to know why the writer wants to write a workout book. What’s the story behind the information? That’s interesting. Not necessarily the information. I have a very clear notion about what THE STORY GRID is all about that has nothing to do with prescriptive nonfiction for writers. I have a controlling idea/theme for the book and a Beginning Hook, Middle Build, and Ending Payoff for it too (More on these phrases to come). THE STORY GRID is not just for people who want to write…because STORIES aren’t just here to entertain us. They teach us how to live. Our ability to create them will undoubtedly be the only thing that separates us from robots and drones and SIRI. We need to understand not just how to tell better STORIES, but why they are so freaking important in the first place. So bottom line is HELL YES! Nonfiction Storytelling has genres. Those who know the Fiction genres, will have immeasurably more success writing nonfiction. Thank you for a fantastic answer. I also really appreciate the time you took to write it. Wow, so much information in just a single post. I’ve haven’t written any story yet, but now I have a faint idea of how to proceed with something that I have in my mind since a long time. This will be interesting. Question. When your book comes out, are you planning to have all these graphs and images that you come up with, in the book along with the rest of the material? Yes, of course. The book is written, just got final editorial notes from Steve Pressfield and I’m doing the last tweaks. The delay is in the artwork and design. Steve and I are working with our creative director to make the book as easy to use as possible, as inexpensive as possible, and with all of the graphs and artwork inside too. Much Much better quality than my chicken scratch. One of our challenges is to make the art as effective in black and white (color printing would skyrocket the cost) as it is in color. We’ll offer the color posters for story nerds like myself when and if we nail down the best productive quality and cost. This whole being a publisher thing ain’t as easy as one might think… The book will be an oversized trade paperback (8 1/2 inches by 11 inches) and everyone who subscribes to http://www.storygrid.com and http://www.stevenpressfield.com will get a major discount on the first printing, with other goodies too. More on all of that as soon as Steve and I figure it out. We’re getting there I promise. That’s great to hear. Glad to hear that it will. I think anyone who writes and publishes a book understands the biggest rule with it. Patience. I feel that time pressure against my back right now with the book I’m trying to get out. But I know we can all wait for your book too. It’ll be worth it. One thing I can definitely say about reading through all these posts, is that whoever had you to work with, were fortunate individuals. It comes across in the way you write, and the passion with which you deliver the information. It’s like reading something Steven Pressfield has written. You can FEEL that passion and spark that he puts into it. The love is there, which makes reading it all the better, and one learns more from it. Or maybe one absorbs the information better. Either way, it’s a good thing. Shawn, I’d like to add my voice to the chorus of those expressing their gratitude and a certain level of incredulity at how valuable the Story Grid already is, and will no doubt continue to be. I’ve had the bulk of a story line drawn out in my mind for the better part of a year now, but the “connective tissue” has been lacking. Putting to use the information in just your last three posts (along with your latest contribution to Steven Pressfield Online) has brought me out of the fog. It’s amazing how an hour spent with an actionable tool such as yours can clear away all of the analysis paralysis that always seems to be lurking in the weeds. I certainly hope that you have grand plans for monetizing this unique skill of yours on multiple platforms. You’re clearly not in this game in search of riches…but still, you deserve a healthy bounty of fruit for your labor. Many thanks Tim. Glad to help. an ideal approach of writing? I’ve a presentation subsequent week, and I’m at the search for such information. First thank you for writing such a wonderful book – truly a gift to writers and I don’t take for granted the years it took for you to create this awesome work that makes a BIG difference to me in this journey!! I read McKee’s Story. I love your respect for his TRULY great book – it is fantastic AND yours sits equally beside that on my shelf because of your deep analysis, humble brilliant truth and profound help and support for writers that care about the craft and the work itself. Well done! I believe you and McKee could make a fortune selling a highlighter that all at once turns almost every second sentence and page yellow. For both books I looked back on them and realized I had done just that and I might as well just did them all at once! So thank you for the thoughtful, challenging, fulsome (and fun) read!! 2. in the Performance Genre where the external value at stake is Respect Vs. Shame are their any natural internal values at stake that ‘marry or contrast naturally’ with this to provide an interesting contrast. I understand that the ultimate payoff of these ‘to the end of the line’ will most often and most satisfyingly be opposite ‘i.e. : external value at stake positive & internal value at stake negative’. The story I have crafted after a few years of work is a boxing story and i am not underestimate the challenge of making these obligatory scenes compelling surprising and to build and pay off in a unique and satisfying ending that has not been seen before. I understand that each year or every few years a new fighting movie comes out that succeeds or not at this. I now need to challenge my story everything against the Story Grid and the obligatory scenes, pace and payoff and I am ready for a good 6 months to a years work on this and ‘look forward to that’. This story is worth it. But I want to be as smart as I can be about this and understand where history and tradition can be leveraged and reimagined rather than created. 3. Lastly would it be possible to work with you (hire you to challenge my story grid) once I have put in the hard work around it and belief it is worth your time to deeply challenge. I both deeply admire the poetry and beauty of fighting/boxing and equally deeply am disgusted by the need for humans to do such physical harm to one another for mass entertainment and to salve internal needs, and my story requires both perspectives. The reason I have chosen this area of performance is that to me fighting/boxing still holds the fundamental truth about the performance genre squarely in its sights in the tight confines of that lonely ring. I cannot recall the person who said this but i love it and know you have your own relationship to fighting; A fighter does not fear the potential pain, he fears the possible humiliation. Exactly. I covered a lot of your questions in my USING THE STORY GRID TO OUTLINE and OUTLINING A REDEMPTION STORY and FORM VS. FORMULA posts. So give those a read to get a handle on the PERFORMANCE EXTERNAL GENRE and ways in which you can amplify it with the addition of one or more INTERNAL GENRES. As per number 3, my freelance editing time is extremely expensive as I only agree to do one or two edits a year. Like so crazy expensive that only Big Five publishing companies or writers with huge advances can afford. Editing is extremely intensive and time consuming…just like writing…so I only take on things that extraordinarily personal to me or financially attractive. One thing that may be of interest is that I’m in the process now of working out a podcast of sorts with a friend who is an amazing marketing/publicity force in the business who is interested in spending more time writing fiction. We’re thinking of walking readers/listeners through a long series that would just be him hammering questions at me based upon the principles in THE STORY GRID from the point of view of someone just “Turning Pro.” I think it could be a lot of fun and could go a long way to helping people like you in the early stages of project planning. Anyway, stay tuned for that. P.S. We’d work out a system too for readers/listeners to send in questions they want me to answer and we’d include those too in each episode. Thanks Shawn and I completely understand the scale of your editing work and no problem and glad it pays the bills and more. LOL Anyway thank you for your nice reply. Yes will take advantage of those resources and for sure will very much enjoy the the podcast, it sounds great. And because ‘extremely expensive’ is all relative could you shoot me an email to say what a couple days of your time would cost in a consultation and discussion around a story grid – [email protected]. Thanks so much and keep up the great work and cant wait to dive into those posts. Just finished reading the book and I downloaded the infographic from the resources page. But do you have a large PDF of the infographic from the book? I want to post this on my wall and the version from the book would look much better (I only have the ebook version otherwise I would scan it myself). You can purchase a poster of the clover here http://shop.blackirishbooks.com/products/the-story-grid. It’s $15.00 and is unframed. I tacked one up over my wall and it does the trick. Hope that helps. Oh thanks, that looks great! I’m a bit late to the game but I’ve been reading your blog and listening to your podcast and just had to say thank you. As a person from a science background myself this stuff really helps. I do have a question though. I’m trying to wrap my head around the 5-leaf method for a fantasy novel such as Harry Potter or LOTR. Obviously the time would be long, the reality: fantasy with a magical subcategory, style I think is drama, but I don’t know where to go from there. Would they be archplots? I think they are both heavy hero’s journey as opposed to miniplot even though there are a lot of other characters and internal struggles (so that might answer that question). As for the content, however, I’m at a loss. I think the inner content genre would be worldview (and a few differences in subcategories depending on if we say HP or LOTR) but what would the external content genre be? Can you have society and war stories that are categorized as such but are set up to be a part of the created world? Maybe I’m off track here but I was wondering if, even though your interest seems to be more in thrillers and reality, you could help me categorize this. I would classify LOTR as epic action adventure with multiple archplots. Same with Harry Potter. And both also have multiple internal genres at play as well. They’re both quite complicated and unfortunately I can’t do them justice with just a quick response. But that should get you headed in the right direction. Thank you.. That definitely helps. This method in general makes sense to the way my brain works and I can’t thank you enough for that.